Rockman Unity is celebrating April Fools' Day with the unveiling of FOUR new D-Arts figures. Classic Roll (in Mega Man 8 duds), Ultimate Armor X, Iris, and Zero from the Zero series . Exciting! Oh, wait. I did say it was April Fools'... didn't I? True, and Rockman Unity admits that. But ONE of these four figures, according to Ucchy, is the real deal. Only one character will be immortalized in plastic. Who could it be? Let's speculate. Going by the evidence, only one image shows the engineering of a would be, typical D-Arts figure: Zero. But that's far too obvious, right? He might just be the red herring of the lot. It's probably Zero, but I'd love the Ultimate Armor X. Roll's is new art, but it's from her kotobukiya figure. As much as I would like an Ultimate Armor X, I'd probably hope for the Iris figure to be real. Even though it's not for me, I know there are fans who would want a figure of her. The others are downright superfluous (or unappealing) and I couldn't imagine buying them. I would hate to think that the lousy sales of one of them might put an untimely end to the D-Arts Rockman line. Come on, Bandai! Let's see some robot masters! My money's on Ultimate Armor. I think Nakayama's Zero already had a toy and Iris is just not happening. Oh lawd, I'd Love me an Iris D-arts!!! It's probably Zero, but dear god I hope it's Ultimate Armor X.
I'd take any of these but Classic Roll... I would kill for an Iris figure. I would put her in Zero's arms and create a motion censer that screams "What am I fighting for" every time someone walks by. I'd love an Iris(probably won't happen... accessories?) or Ultimate armor X. I'd be disappointed if it was one of the other two(I'd still probably buy them -_-) because they've been released somewhat recently as model kits. Also, I hope they make Storm Eagle or Colonel and figure out what to do with that Sigma figure. I wonder if this is actually a sneak interest-gauging campaign...whoever everyone screams for the most is the one that will end up being 'the real deal'. I wish they'd make the Ride Armor already! But I'd love an Iris D-arts!!!!! I wish it is Iris, as she never had a figure (and recently appeared in Project x Zone). Kotobukiya already did "Zero Zero" and Roll, and there is that old Ultimate Armor figure. I, personally, would love to see figures of BOTH Roll (I don't care that Kotobukiya made a Roll, I want one that's in the same scale as all my other figures) AND Iris… and yet I feel that NEITHER of them is likely the real figure. I’m willing to bet the real figure is X. NO ZERO! NO ZERO! NO ZERO! NO ZERO! COME ON! HES ALREADY BEEN DONE! I mean yeah Megaman has been done before plenty of times too, by the old model kit, and then stupid Jazwares failed at him, and then Kotobukiya, and again Bandai. But give other characters a chance!!!!! As for what Iris could have as an accessory, she could come with Colonels Core/Purple Gem that transforms her into the ride armor. It could include spark effects as well. I'd really wished Iris was real. However, I would have to put my money on either Ultimate X or Zero. 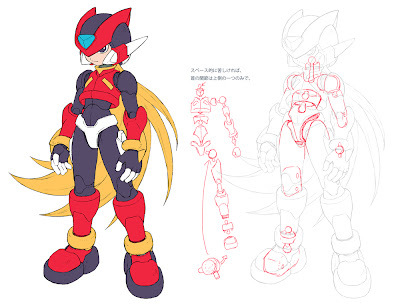 More on X than Zero, cause Zero Zero has a figure already. Weren't they hinting at armor for X? Ummm... The Ultimate Armor X also already has a figure, the old Bandai model kit one. And so does Roll by Kotobukiya. All of them already have a figure except for Iris, well other han that kit that i've seen years ago. But even if they have a figure already doesn't mean that there can't be another. It's either Zero Series Zero or Ultimate Armor X.
Nnnh... I REALLY wanna see Zero Series Zero... but... Ultimate Armor X is going to be the real thing. Ultimate X or Iris, I'd say. It makes little sense to just follow suit with a lot of the same models Kotobukiya has already done. What, are they trying to replace them? Some different, obscure characters would be nice. Heck, why not Axl to complete the "trinity"? This is a cruel joke indeed... we're trying to figure out which ONE it is and it probably turns out to be all four getting released in the future. Very cruel. I'm probably wrong, it's just a theory. Roll is probably out of the question. I'd bet my money on a D-Arts Protoman before Roll. Iris would be neat, but I doubt it. Too random and out of the blue, considering they seem to be going mostly in order for figures. (X, X1 Zero, X1 Armor, Vile) I WOULD say i would expect Sigma before Iris, but it wouldn't be surprising given Sigma is still in concept limbo due to the question of making it a figure or a large scale statue like what was on display. But I couldnt say. I'd say it's a tie between Ultimate Armor and Zero series Zero for "possible" real ones, with Iris as a runner up. That said, both an Iris Or UA X would be FINE to me. I'd buy Iris in a heartbeat. no seriously, I would. I want one Capcom and Bandai, I WANT ONE. I beat it's going to be armor X, the easiest one to do for them. I really hope it's Iris, we already have Roll and Zero, even if they are the model kits from Kotobukiya. How do I know which one to hope for?!??!?? I don't specifically care about the Zero series, but still, it's gorram Zero. I can't NOT want that. Ultimate X from X4 is my favorite armor(gameplaywise) for my favorite character of all time, so that's super awesome. But that would already be my 4th D-Arts MegaMan figure (not including the non-SDCC X that I'm going to also get when it is rereleased which would make 5). How bout we give some other characters a shot first before we go making every last iteration of X? Maybe a super awesome Maverick like Launch Octopus, or Sting Chameleon? X4 might be my favorite game, and Iris' death is just heartbreaking. I'd buy the hell out of an Iris figure just so she and Zero can be together on my shelf. People gotta stop disrespecting Roll. Roll's awesome. What is Rock without Roll? Roll is one of the most important characters in the entire franchise, and this design is her best one (with the exceptions of Roll Caskett and Roll.exe, who are technically different characters)! WHAT AM I FIGHTING FOOOOOORRRRR!!??????!????? Wouldn't mind seeing a D-Arts Roll with Tango or Eddie tbh ... + with D-Arts focusing on the Classic MM series for the 25th Anniversary with MM & Bass so far wouldn't suprise me if Roll wasn't far behind. The Ultimate Armor & Zero i could see them doing simply because it opens up a Zero line to gauge interest there & the X series is always popular.. Iris would be cool but not many people outside of the fanbase would recognise who she is.. I'm betting Iris. I'd think that would be good one. Don't get me wrong; Ultimate Armor X would be something I'd buy no questions, but Capcom hasn't been the most helpful in terms of reliability. I'm betting they'll throw a curve ball; and Iris would most likely fit. Runner up would be roll though. In spite of the day, I really, REALLY hope the Iris one is legit. I'd buy that one in a snap. Having assembled the Kotobukiya Zero model a couple of times myself, along with the rest of the Kotobukiya models, I'm 90% certain that these drawings of Zero are from the Kotobukiya sculpt; the pieces and joints are almost exactly the pieces and joints from the Kotobukiya kit. The Roll art is pretty much from her Kotobukiya kit, too. Ultimate Armor X is clearly the real toy here; it's new art with specific color/sculpt instructions, and multiple poses. Zero-series Zero is about the only one I WOULDN'T want to be real, although he is probably the most likely. Not only did Kotobukiya do it already but there are no other characters of the same series to scale him to (at least Roll has a matchup with Bass and the dogs going for her). It's interesting to note that while Zero is the only one with mechanics, he's also the only one without a back view. Ultimate Armor X would be AWESOME, but it strikes me as one of those oft-requested cop-outs that nobody ever feels is really worthwhile. That and the stock artwork trying to pass itself off as a design note by including the detailed foot (which is redundant). Would KILL for Iris. Generally not perceived as a "mainstream" character, sure, but IIRC she was, like, the next most popular female after Tron in the polls. And she was just in PxZ (which Bandai publishes), so if they WERE going to do it, now would be the time. The Ultimate Armor art is the same that's bee floating around for years. There isn't anything new about it. Besides that, Iris could also change her appearance between the X4 and Xtreme 2 ones, like Kotobukiya's Roll original/MM8 look. We've already had recent Classic Roll and Zero series Zero. Bandai did Ultimate armor X, so I have one of those. Give me an Iris. Tch, I sold that cheap Bandai snap together Ultimate Armor years ago. Kept the X3 Gold Armor, though. Ultimate Armor X and the famous Plasma Shot deserve the D-Arts treatment. That said, Iris would definitely spice up displays and sell more Zero Ver. 2's. The only ones I'd want would be Iris or Ultimate Armor X. But at the same time, if I wanted a MMX female, I'd rather have Ferham, Cinnamon, Marino, or Aile. I'm with Rockonymous. Let's see some robot masters. Bandai's old Rockman 8 kits weren't too bad, actually, but certainly lacking in the area of articulation compared to the D-Arts series. I'd say UA X is the safe bet, he was in 5th place. I don't remember part 1 of the poll , but I'm assuming these are the top 10 from part 1. I think it's time for another poll. Here is hoping that the joke is actually the amount of figures and tomorrow it will be revealed only 1 will NOT be made! Or better yet, all 4 will be done! Lol its roll people.i already own both classic and megaman x figues but i need that roll one.